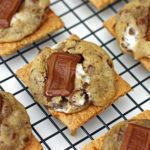 These cookies are inspired by the ever so famous s’mores that we have had at campfires. Graham cracker on the bottom, place a piece of Hershey chocolate on it and then the fun part…melting your marshmallow on a stick over the fire. Add that to the graham cracker and chocolate and top it off with another graham cracker and there you have it. One yummy treat! How do you like your marshmallows cooked over a campfire? I like my slightly burnt. I remember when I was a kid, my dad liking them burnt…or maybe he was just being a nice dad by eating the ones we burnt and just said he likes the burnt ones?! :o) I’ll have to ask him one of these days… When you take a bite of these cookies, you will think you are eating a s’mores…without the campfire, of course. I made these several times in a few weeks, at the request of my son (AKA one of my taste testers). He wanted me to make sure it was not too much of a chocolate chip cookie and just enough to make it taste like a s’mores. He has become quite the food critic…which is a good thing. It helps me make my recipes be the best they can be! :o) I made them with more cookie batter, then a little less. The perfect amount was 2 tablespoons of dough on each graham cracker. I don’t have a two tablespoon cookie scoop, so I just used my one scoop and combined the two cookie dough balls. I made them in to a ball and then flatten the ball a little to make more of a patty (kind of like making hamburgers). Then place the cookie patty onto the graham cracker (see photo below). Let them bake for 9-10 minutes at 350 degrees. 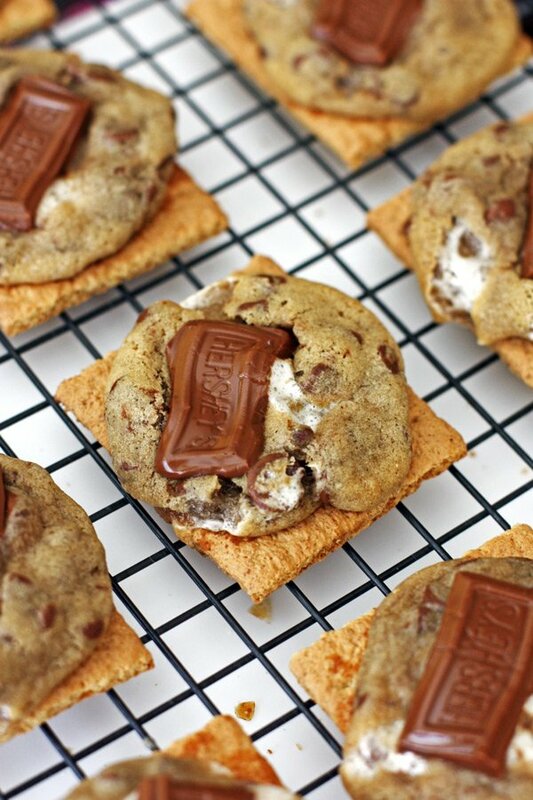 At the last two minutes of baking, place one small Hershey bar on top of each cookie and continue baking. Let them cool on the cookie sheet for five minutes before removing to a cooling rack. Let me know how you like them. This cookie batter recipe is what I use for Our Favorite Chocolate Chip Cookies. It is just that. Our favorite. Give those a those a try too when you can because who doesn’t love a good chocolate chip cookie? School will be starting soon…maybe make a batch while your kids are at school. I always like the idea of them walking into the house smelling the cookies baking and having a cookie and cold glass of milk after school, talking about the day. What a treat…for both our kids and us moms! 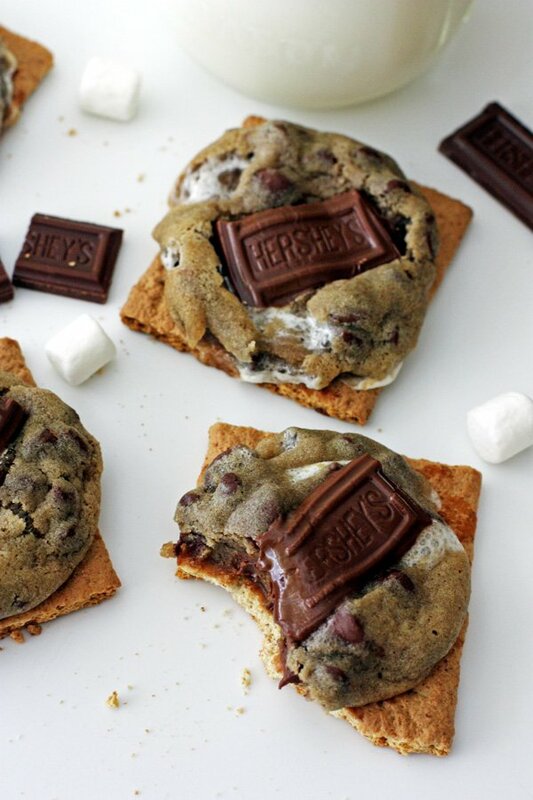 A chocolate chip cookie that tastes like a s'mores! In a large mixing bowl, beat the butter until smooth and creamy. Add the sugars and beat on medium speed until light and fluffy. Add in the egg and vanilla. Mix all ingredients together. In a separate bowl, combine the flour, cornstarch, salt, baking powder and cinnamon. Slowly add the dry ingredients to wet and mix until completely combined. Add in the chocolate chips and marshmallows. Cover the bowl tightly and chill at least 2 hours and up to 2 days. Once the dough has chilled, let the dough sit at room temperature while the oven is preheating to 350 degrees. 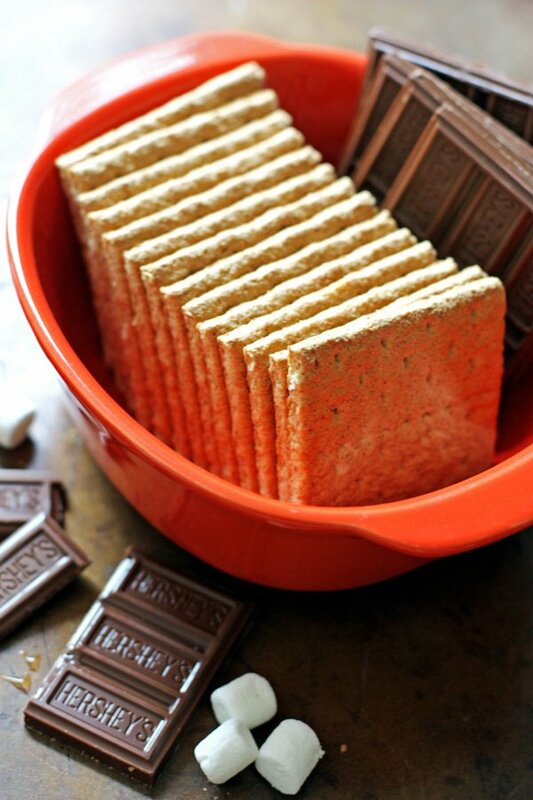 Break graham crackers in half and place six at a time on the ungreased cookie sheet. Make cookie dough into two inch size balls, then press down slightly to form a patty. 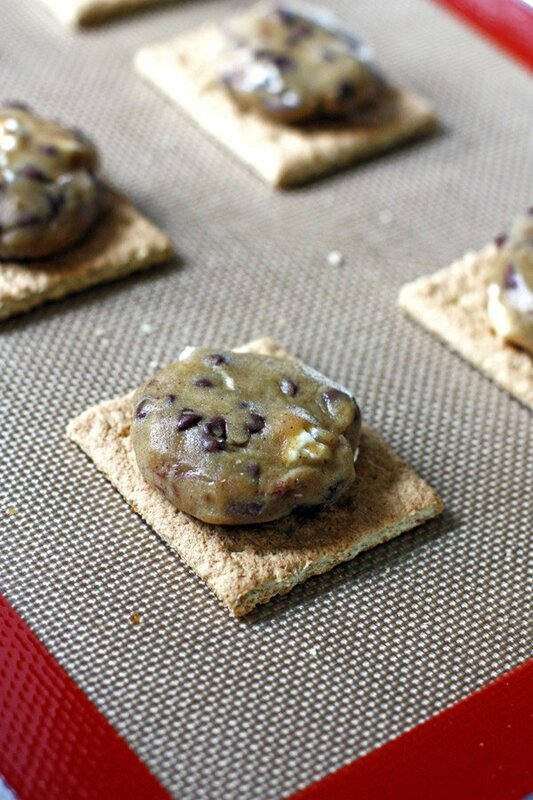 Place the cookie dough patty on top of each graham cracker. Bake 9-10 minutes. At the last two minutes of baking, gently place one small Hershey chocolate bar on top of each cookie. Let the cookies cool for five minutes on cookie sheet, then place on cooling rack to cool completely.